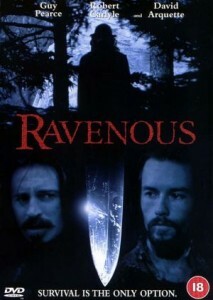 Ravenous is one of my favorite movies from when I was in high school. It was passed over by a lot of people, but it has David Arquette’s name on the box, so I forgive them. The reviewers for the most part were not kind to this movie, but I think it holds up well and it is worth a look. The story is a about a soldier who during a battle fakes his death and as a result is thrown under a pile of bodies. He wakes up and is enraged and turns the tide of the battle, and it is promoted for his ‘victory’, but his commanding officer guesses at his cowardice and sends him to the middle of nowhere. At his new post he finds that his power and strength may have come from the blood dripping in his mouth, and he may not be the only person that knows how to harness this power. So right now you are thinking “great a movie about cannibals and David Arquette, that means I am out!”, but it is still awesome, and David Arquette has a minor role and gets eaten, so that is a plus. This movie is so unique and fun, it is hard not to have a good time, and for the record Roger Ebert agrees with me. My buddy TK and I must have watched this movie like 30 times. TK even had the soundtrack which is one of the best parts of the movie. The music is so offbeat it just adds to the character of this movie. If you are looking for something different to watch, and aren’t afraid of a little blood, you should give this movie a try, and if you don’t like it you can blame TK and me. Amen, Ravenous is the best cannibal movie ever! Thanks to you I also was able to enjoy this film. I’ll have to watch it again, maybe with Anna. I am glad to see my questionable viewing choices have affected the Brim Family so much. Previous PostPrevious Is there something wrong with Prometheus? Next PostNext Are We Headed for an Idiocracy?